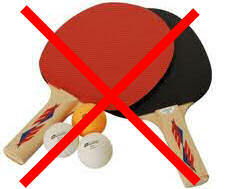 Cheap table tennis bats are rarely any good, yet spending a lot of money does not guarantee a good bat. This article tell you how to find a decent bat at a budget price, something you can use to have at least a half decent game of table tennis, so that you can upgrade to a better bat when you’re ready. There’s cheap and then there’s ‘really cheap’, which often translates to ‘really crappy’ equipment. Virtually all the ‘cheap’ table tennis rubbers and blades are made in China, but there is huge difference between the real cheap and crappy stuff, and the good quality Chinese equipment. All these bats are so-called ‘pre-made‘ or ‘factory assembled‘ bats, which means the compete bats is mass produced and packaged at the factory. Below are the different types of bats on the ‘crap scale’, the more craps the worst the quality. The real cheap table tennis bats are mass produced in high quantities, and usually has the rubber and blade fully assembled, and it’s the sort of stuff you find in the big department stores. It’s the sort of thing you’ll find as part of a package deal with the table or net, and often comes with some balls as well, like the ones pictured right. The blade feels cheap and uncomfortable, the rubbers are thin and hard and are often no-brand. This might be OK for a bit of fun, but it’s hardly ‘table tennis’, and more or less just ‘ping pong’ as you can virtually create no spin with these bats and all you can do is knock it back and forwards over the net. Don’t touch them! Next on the scale are the most basic table tennis bats you buy from Sports Stores, typically costing from about $10 to $30.The blades look a little nicer, but the rubbers either have no label at all, or just have the brand on the handle with a few stars. Rubbers colours may be red and black, but there’s still some other colours like green and blue as well. These bats is still intended for the basic recreational market, and range from fairly crappy to almost half decent bats. They may be of a high profile brand, but it does not matter, they are all still made very cheaply in China and are not necessarily any better than unknown brands. The rubbers do have a bit more grip, but hardly suitable for producing any kind of spin. Don’t get excited about the star rating of these bats, it means NOTHING and is just used for marketing. For anyone interested in a half decent game, I would not recommend these either. Next on the scale are those bats with ITTF approved rubbers, typically costing from about $20 to $90. If you see the logo picture (right) on the rubber, then the rubbers are approved for competition, which mean they do meet a minimum quality requirement. This does not mean the blade is of high quality though, but for at least beginners, this does not make such a big difference. These bats are usually marketed with fancy packaging with pictures of the top players, and they’re often from non-Chinese brands and/or high profile brands, The name nor the player makes little difference though… these are still nothing like what competition or professional players use, these players all use custom bats. At the right price, these may be worthwhile if you’re just beginning and are on a budget. So which table tennis bat would you choose? must have ‘ITTF Approved’ logo on the rubber. OOAK Shop carries a few of these pre-made bats, and only carry those that meet the minimum requirement above. 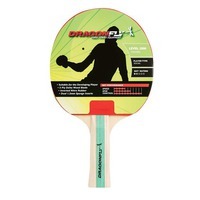 The 729 Friendship Fighter 1 (pictured right) is a good example, which has smooth rubbers on either side for high spin, has a 2.2mm sponge on both sides, and the rubbers are ITTF approved. What if I want something better? If you do want something better, then you need to look at a custom table tennis bat. Prices for custom bats actually start at around $50, which is actually below many of the pre-made bats. Both the rubber and blades will be Chinese-made, but although the Chinese can make some cheap rubber, they also make some very high quality equipment. The blades are made to a minimum quality standard, and you can see the quality of the blade face as it’s not covered by the rubber. A basic custom bat is likely to be better than almost any pre-made bat, so if you can afford it, I would always recommend this. If you are considering a custom bat, it’s important that you choose a rubber & blade combination that works well together. This is where OOAK Shop provides a wide range of custom bat options, of blades & rubbers that do work well together, for a range of levels and budgets. 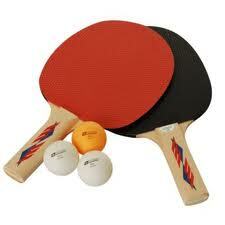 You can find our range of custom table tennis bats here. 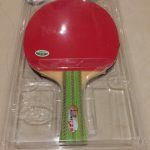 If you are willing to spend a little more, and prefer something of a specific brand, we also provide options there, where we’ve created rubber & blade combination for Butterfly table tennis bats, or for German brands like Tibhar or Joola. OOAK has also recently created a professional table tennis bat range, which has the blade & rubber combination that actual professionals use! These are the absolute top of the range table tennis bats you can buy, assembled professionally by the OOAK team, so you can try what an actual professional uses. We’ll continue to add further proven combination to our range. If you have a specific requirement, for a combination of certain brand, or perhaps something for a specific style, feel free to contact us, and we’ll provide you with some options tailored to you. We love doing this, and this is our area of expertise, so please don’t hesitate to ask. Table tennis bats don't need to be expensive, but how do you tell if it's cheap bat or good value? This guide tells you what to look for if you're on a budget, and still want something half decent. Choose the right bat to help your game, not hinder it. Do you mean red and black on both sides or red on one side and black on the other? For competition you must have a red rubber on one side, and a black on the other.